1. Butter an 8x8-inch or 9x9-inch square pan. Line with parchment paper or foil, and butter that; set aside. 2. 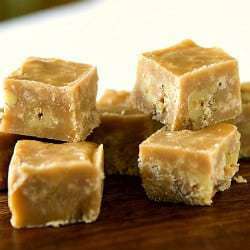 In a medium saucepan, combine the sugar, evaporated milk and butter. Bring to a full boil over medium heat. Reduce the heat slightly (no lower than medium-low) and boil for an additional 10 minutes, stirring constantly. 3. Remove from the heat and stir in the powdered sugar, vanilla extract and maple flavoring. Transfer the mixture to a standing mixer (or use a hand mixer) and beat the fudge on medium speed until thick and glossy - about 3 minutes. Fold in the walnuts and pour the mixture into the prepared pan. Note: You can find the maple flavoring in the baking aisle where the vanilla extracts are.